One of my biggest regrets in life is not taking money seriously early on. 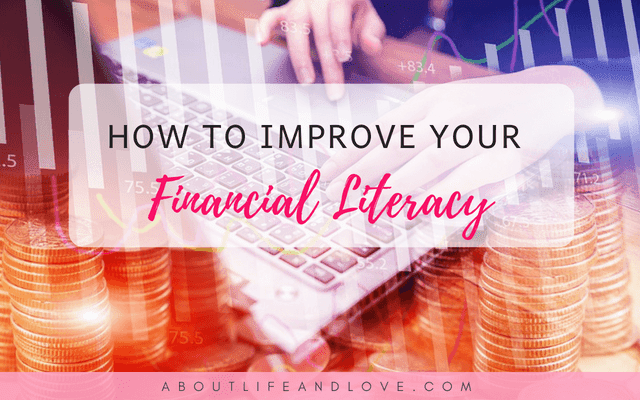 If I can give my younger self any advice, it is this: improve your financial literacy. How to improve your financial literacy and be truly rich is not as hard or boring as it sounds. Especially thanks to the internet. Genius Albert Einstein himself said, "Compound interest is the most powerful force in the universe." Time is essential in investing. At the present, it is bear market (prices are falling). While the stock market is down is actually a great time to buy. Because it's like shopping while everything is on sale. I'm not an expert in investing. In fact, I don't have millions---yet (that's the dream!). That's why I do my research, I read books about it, I attend seminars and webinars to help me change my mindset first and learn the right strategies in increasing my income flow. I look for people or organizations that can guide me and help me reach my goals. That's why I signed up and became a member of the Truly Rich Club. Why Truly Rich? Because true wealth is not just about increasing your finances. It is also about growing abundantly in all areas of your life. As founder Bo Sanchez believes, you can get rich without robbing your soul. Everybody wants to eat but only a few is willing to hunt. We all wish we have a convenient and comfortable life. Sure we hear some people say they just want the simple life. That wanting to be rich is ambitious, selfish and worldly. But you also hear them complain about how they can't afford something they want---even it's just as simple as going to the movies or traveling. They'd say "If only I have some extra cash, I'd buy this or I'll do that." Most people are content to daydream about becoming rich but they don't want to put in the work. They don't like to hassle. They want to skip the grind. In the animal kingdom, you don't get to eat if you don't hunt. I have joined several networking companies promising a quick way to become wealthy. 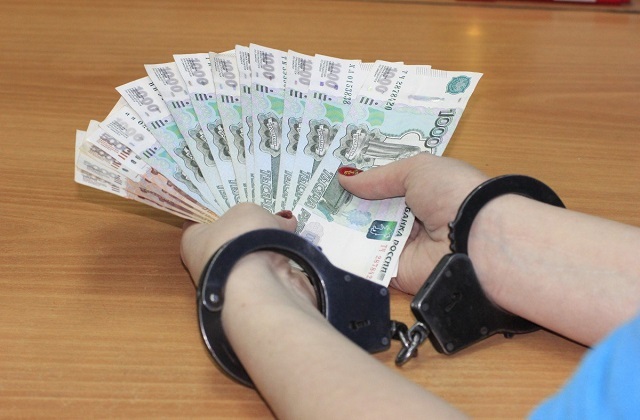 In my recklessness as a youth and my dream to "retire young and rich" I invested hard-earned money to these companies. I've learned my lesson the hard way to put it simply. But these lessons are priceless. And I'm glad that somehow, I took the risks in investing while I was younger and single. It would have been a different story if I gambled my kids' tuition fees or used my retirement fund for it. Start early so you can fail early. Then start again. Wiser every time. It is part of God's plans to prosper us (Jeremiah 29:11). As a good Father that He is, He generously provides for our needs and takes delight in blessing us abundantly (Deuteronomy 30:8-10). As a gift, prosperity needs to be shared. Prosperity should be used to help build the kingdom of God. God wants His children to live abundantly. Translation: God wants us to be rich. If you don't want to believe me, read what the Bible says about money. In my journey towards financial freedom through financial literacy, I often stumble. It's tempting to stop and be content with good enough because honestly, what's wrong with that? Having enough means you can eat three decent meals a day. You can travel once in a while. You can watch movies whenever you want. You can have a slice of cake for dessert. You can enjoy life having enough. But then I would see people and animals who are homeless, sick, abandoned and clearly needing help. I can't count the times I wish I could stop and not just feed a hungry dog in the street but take him home and give him the best life he deserves. But I can't. Having dogs doesn't come cheap. I know the vet bills and food can take a huge chunk in your budget. I know because we have 16 dogs at home. I asked God, "What can I do? How can I help when I only have just enough for myself?" That's when I realized that to have just enough is never really enough if I want to do more good for the world. To be content with the good is stopping myself from becoming great so others can also benefit. No, it's not encouraging people to be social parasites. It's not feeding the sluggard. It's having the means to teach them how to fish and not just give them a fish. To be truly rich is to be a channel of God's grace. It is about being bold enough to ask God not just to bless you with enough but to bless you with a double portion so you can in turn bless the world. To be truly rich is to be selfless. I know my weaknesses and I am fully aware that I cannot be rich on my own. I agree with George Matthew Adams that "There is no such thing as a 'self-made' man. We are made up of thousands of others." I don't know how I passed my Math subjects. I see long calculations and my mind starts to go blank. But money is about numbers. Stock market is about figures. How can I increase my finances through it if I know it will be hard for me to understand? Simple: seek help from the experts. That's what I love about Truly Rich Club. They are a team of experts giving you daily updates about what to buy, sell or hold in the stock market. Not only do they send Power Talks and tips you need to prosper financially, they also send inspirational talks about health, personality development and most of all about spiritual growth. GodWhispersClub.com - Get A Megadose of Blessing. And Take Your Life To A New Direction. I have never attended a Wealth Summit by Bo Sanchez because honestly, it's quite expensive. 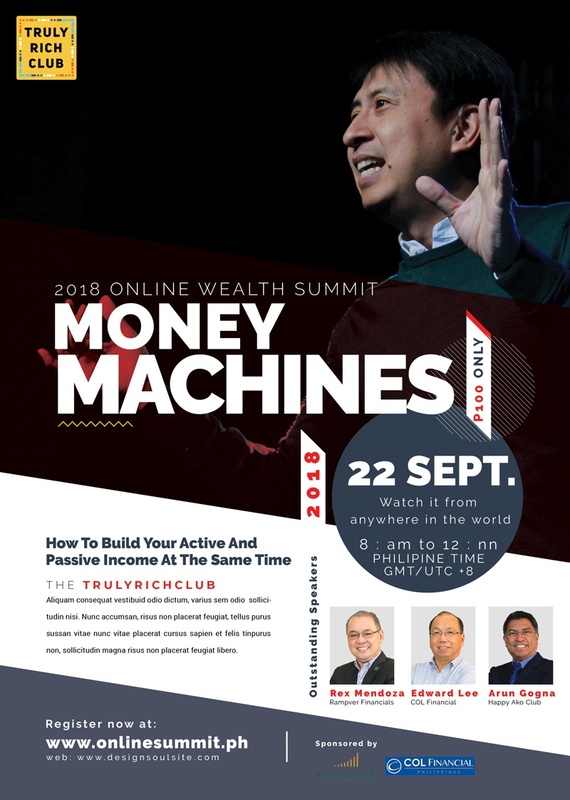 The first ever TrulyRichClub Online Wealth Summit is here! It will be on September 22, 2018 (Saturday, 8:00AM to 12:00PM). Webinar fee is 100 Php or 2 USD (Price will go up to Php 200 or 4 USD by August 11, 2018). How much is your cup of coffee? How much did you pay for your smartphone? How much did you spend on your last shopping? How much was that movie ticket? Surely, it's more than this ticket price. This is a rare opportunity that you don't want to miss. If you're ready to change your life and bless the world, this is your ticket to that. Be financially free. Learn how to improve your financial literacy and be truly rich. Our blessings are not only for our own enjoyment. Yes, I agree. It is meant to be shared to bless others, and in doing so we are telling the world of good our God is. This is a great learning opportunity Lux! I signed up. Thanks for sharing! I would agree that one must plan way ahead from Day 1, and save for a rainy day...like after retirement, for instance especially when one is not eligible for pension...and yes, we are rich when we are blessed and we share our blessings with others. Sure many ways to get scammed, all have fallen for a few. But wiser we are and those stairs are the way. Lots of valuable thinking here. I especially like "To be truly rich is to be selfless" and "There is no such thing as a 'self-made' man. We are made up of thousands of others." This was such a great + informative read, babe! Saving is so key. Such an interesting post, Lux! Muito interessante esse assunto! Gostei bastante. I think that first we have to really grapple with our issues related to money - we all have them. It's become in many ways, connected with yucky feelings. But everyone deserves to live a life with his/her basic needs met and beyond. I agree there is no shortcut to success, unless you are very lucky. I think patience is important to gain success.